Time just seems to disappear completely on me these days. I was doing such a brilliant job of keeping up to date with everything, and then-bam!-one day missed turns into a week later. I was busy with organizing the house, cleaning up the yard after 10 days of rain and travelling with the husband. There was definitely some reading in there to recuperate from massive amounts of cleaning and yardwork. The briefest of reviews will come today as I get back on track with my upcoming novels for Netgalley and an interview with Anna Kashina. An exciting conclusion to the week, in my humble opinion. 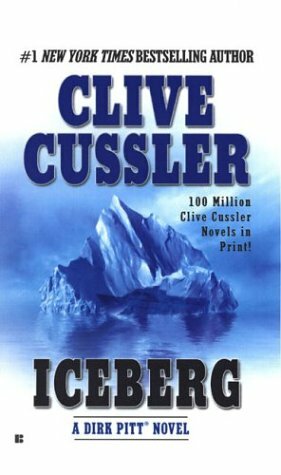 I enjoyed The Mediterranean Caper so much, I picked up Iceberg to see if it was a fluke or maybe, just maybe, I actually like something out of the adventure/spy genre. I think I managed to come across an author that has plenty published to give me a genre shake up every now and again. The novelty might lie largely in the date of publication and the removal of the PC filter. There is actually some pretty forward thinking stuff in these novels when you just let an author write the character as he comes out of imagination. Dirk Pitt entertains me. I was even thrown off the scent a couple of times because the plot became over the top conspiracy level. I just never would have gone there in a million years, and I didn't hate that the author did.